It feels like it is taking me forever to write this trip report – maybe it’s because I have more pictures and videos than in previous years, or maybe it’s because I’ve got lots of other work going on that, these get pushed down the list. I do plan on finishing this 2015 Disney trip report before we go on our next holiday (for which I have to still write the pre-trip planning report!) so thank you for your patience while I get these done! So on with the final part of Day 6, where we spent an afternoon in the pool, then got ready for our reservation for the dinner show – Hoop-Dee-Doo Musical Revue – at Disney’s Fort Wilderness & Campgrounds. 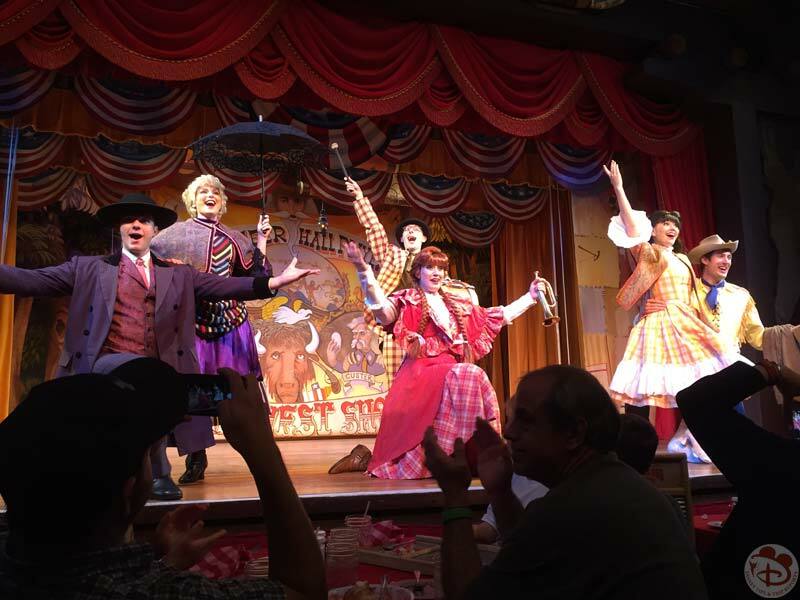 We loved this dinner show when we saw it in 2014, and looked forward to seeing it again. 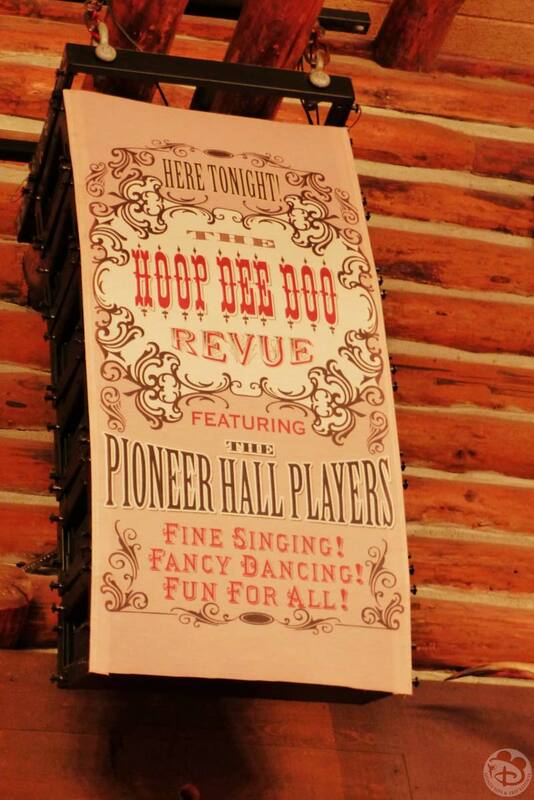 The show is performed in The Pioneer Hall, which is in the Settlement area. You have to catch a bus from the Outpost parking lot, so make sure you plan your timings accordingly. Alternatively, you can catch a boat to Fort Wilderness from Wilderness Lodge, so ideal if you are staying at that resort. There is also a bus from Wilderness Lodge which goes directly to the Settlement (which we didn’t realise, until we drove, parked, and caught a bus from the Outpost). However you decide to get there, allow time for transfers etc. If using Disney transport alone, it’s advised to allow 1½ hours! We must have arrived super early this time around, as the previous show was still going on! With the diners then exiting, and new ones wanting to go in, it was a bit of a disorganised sea of people outside. so do hold onto little ones’ hands if you find yourself in this situation. You have to line up to get given a ticket which indicates which table you’ll be seated at. Once you have that, they then call people in – those that are sitting down on the stage floor area, and those sitting at tables in the balcony area. 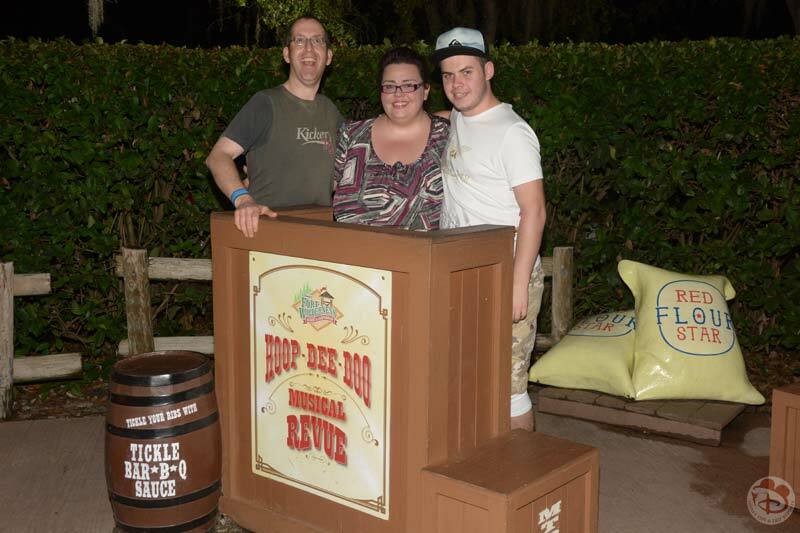 You can also have your photo taken if you like, by a Disney PhotoPass photographer. When it was time to go into Pioneer Hall, we found that we were at a table, right down at the front (well, 2nd row back), centre stage, which was very cool. The menu was the same as last year (and is probably the same from year to year). 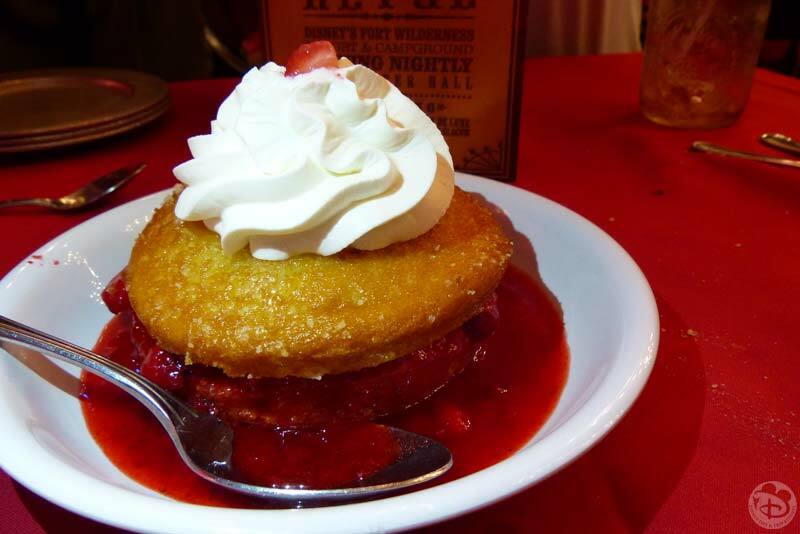 But the fried chicken at Hoop-Dee-Doo is good, and so is the corn bread and mashed potatoes! When it comes to the Deluxe Disney Dining Plan and dinner shows, which are table service, served family-style, you are entitled to the full meal – appetizer, entrée and dessert, non-alcoholic beverages and also some alcoholic beverages (age 21+) for 2 credit per person. Tip is included in the price. Beverages: a selection of soft and alcoholic drinks including: Coca-Cola, Sprite, Root Beer, Iced Tea, Milk, Wine and Beer. The food is served in little metal buckets which I thought was awesome, and as I said before, the fried chicken is so good! It is all you care to eat, so we were offered more when our waiter saw the empty buckets. Don’t be shy at requesting more if this doesn’t happen. The food is served just before the show starts, but they do continue to replenish drinks and food (if you wish, see above) during the show. I’m currently uploading the videos from 2014’s performance, as we didn’t video it in 2015 – since we had already done so the year before. 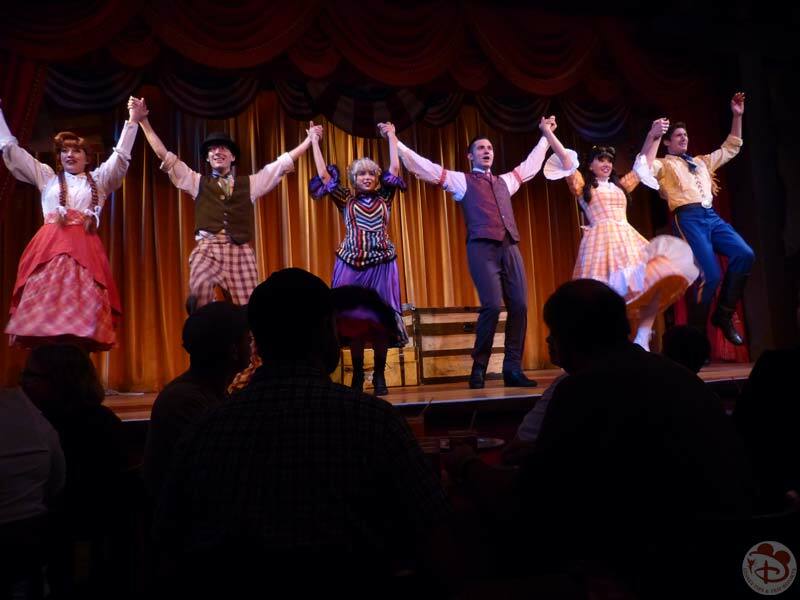 The cast members were the same, apart from 2 of the men, I don’t know which character is which, but here are their names in the show: Claire de Lune, Johnny Ringo, Dolly Drew, Six Bits Slocum, Flora Long and Jim Handy; so two of those guys! The first part of the video is below (it’s split into 5 parts), and some of my photos too. Make sure to subscribe to my YouTube channel, so that you don’t miss the other parts! 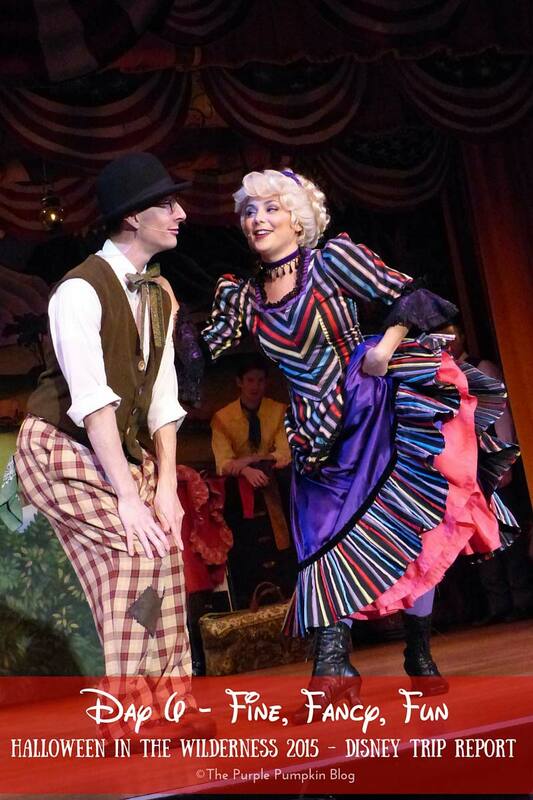 Hoop-Dee-Doo is a Wild West dancing, singing and zany vaudeville comedy show. 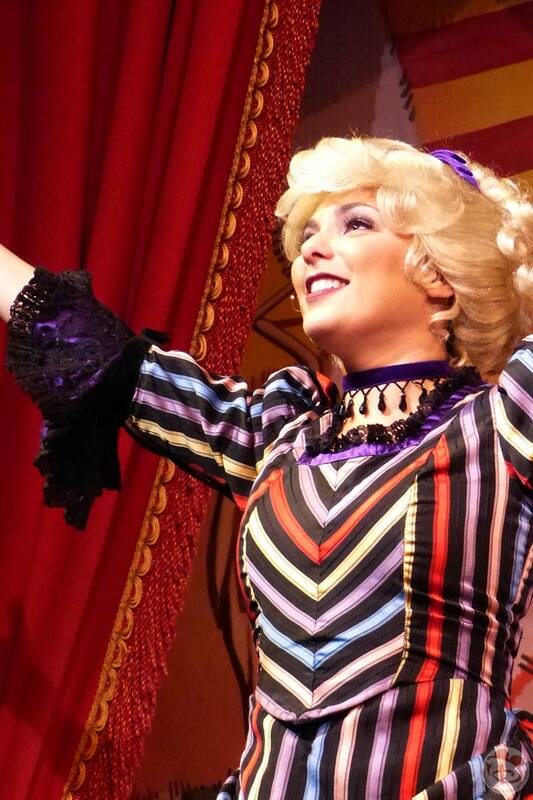 It’s full of good show tunes, slapstick and corny jokes, and you can’t help but clap your hands and stamp your feet! The show is about two hours long, but it really doesn’t feel like it, in fact, we were quite disappointed when it was all over! There is some audience participation towards the end. I’m not sure how they pick people out, and the players, do come out into the audience from time to time. At the end of the show, washboard “instruments” are handed out per table, which you can use a spoon to play along with. Great fun! After the show ended, we caught the bus back to the Outpost – it was then that we noticed a bus going directly back to Wilderness Lodge… so knew for a next time (for when we has lunch at Trails End Restaurant at Fort Wilderness a few days later). But we had to go back to get our car, so had to wait for the correct bus. Fort Wilderness is general is pretty dark at night, with just the minimal amount of street lighting, so keep an eye on younger children, and watch for things like the kerb. Back at our resort, we hung out in the lobby for a bit, before heading up to bed. Tomorrow is our first time on this trip to Magic Kingdom!